Instagram is a useful and aesthetic way for your university to reach out to its community. According to Statista, the image-sharing platform has over 150 million active daily users. In the US, a 2015 Pew Center Research survey found that Instagram is the social media platform American university students use the most. We’ve already outlined how universities can make the most of Instagram. Here are four tips for getting the most out of Instagram Stories. Define your key audiences you want to reach. Prospective students, existing students and alumni are three distinctive groups you may want to start with. Other audiences could include prospect’s parents, higher ed professionals and members of your university’s corporate community. The post below, by Plymouth University, is a great example of a post directly tailored for a specific audience. The uni introduces its open day guides in a way which prospective students will find engaging and personable. It was posted on Plymouth Apply, an Instagram profile solely dedicated to content for prospective students. Instagram users are actively encouraged to browse through content, so anything stories you publish have a short amount of time to grab their attention. Content needs to be immediate and engaging. 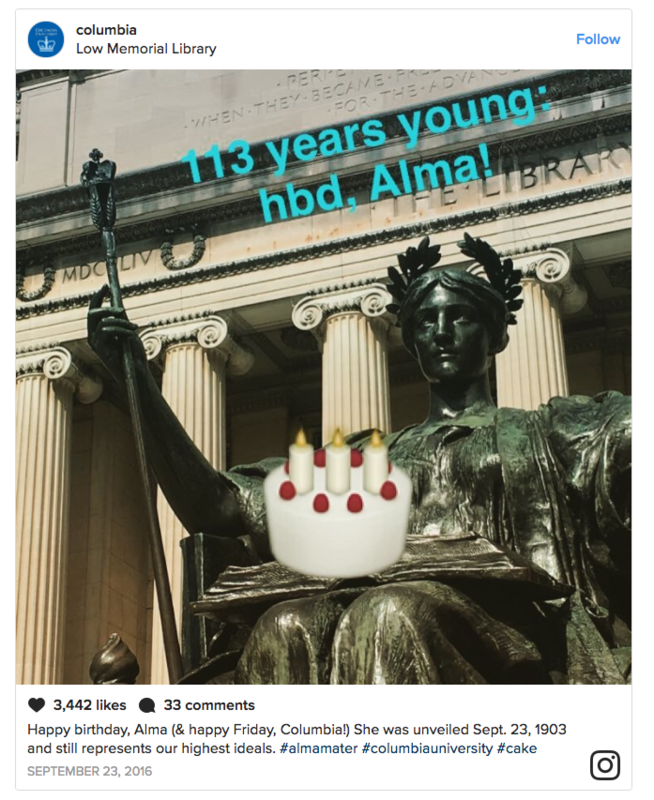 This example from Columbia University takes a striking image of a century-old statue and brings it into the modern day with text speak and a birthday cake sticker. It’s a lighthearted tribute to a Columbia institution which showcases the university’s sense of humour. Social media is a great place to assert what your university believes in and your mission as a place of learning. Instagram lets you do these things in a distinctly visual way. Have a look at the post by Goldsmiths below. To take part in a British Council campaign about international study in the UK, the college promotes its large ratio of international students and encourages students from abroad to respond with their experiences. We're proud that almost 40% of our students are international, making up over 114 different nationalities. To celebrate our diversity we're joining the British Council in sharing stories of what it's like studying in the UK as an international student. Get involved by sharing a photo starting with the caption "Studying at a UK university means..." and post using #WeAreInternational and #Goldsmiths. We'll be sharing your stories on social media during the campaign! Instagram is a great platform for content which reflects the excitement and varied experiences of student life. Show your followers you’ve got a sense of humour. See below an example from Newcastle University. When a giant puddle formed in the city last year, 20,000 people tuned in to watch a Periscope stream of Newcastle’s citizens interacting with the body of water in comic and outlandish ways. In a good example of responding to local news, Newcastle Uni joins in on the fun by taking their mascot Percy to the scene itself.